Altair won four top awards at the 2018 PropertyGuru Asia Property Awards in Colombo, taking the major honours at this prestigious event held for the first time in Sri Lanka to recognise leading players in the country’s real estate sector. 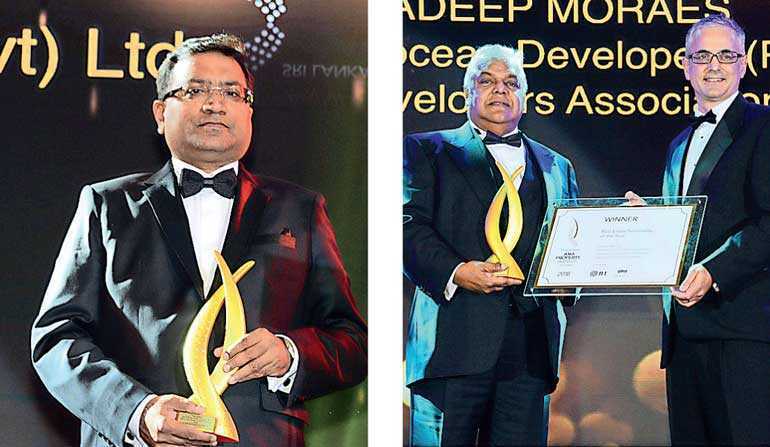 The iconic twin tower luxury residential development was presented with the Overall Award for ‘Best Condominium Development’ and the awards for ‘Best Luxury Condo Development (Colombo)’ and ‘Best Luxury Condo Architectural Design (Colombo)’ while its only Sri Lankan Director Pradeep Moraes was named ‘Real Estate Personality of the Year’ at the awards gala. The region’s biggest and most prestigious real estate awards series, the PropertyGuru Asia Property Awards are recognised as the ultimate hallmark of industry excellence in the Asian property sector. The selection criteria for the PropertyGuru award for Best Luxury Condo Development includes assessments of Design and Amenities (functionality, innovation, green amenities); Location; Value for Money (price); Use of Space, Construction and Materials (quality, key features); Unique Selling Points; State of Completion and Sales Success. The award for Best Luxury Condo Architectural Design is based on Use of Space; Design Concept and Innovation; Amenities; Construction and Materials; State of Completion and Sales Success. The overall award for Best Condominium Development is selected from the winners of all condo categories in the Development Awards. The award for Real Estate Personality of the Year is the only award for which the recipient is selected by PropertyGuru’s Property Report Editorial team. The first award of its kind presented in Sri Lanka, it recognises Moraes’ contributions to raise standards in the local real estate sector as well his work as Chairman of the Condominium Developers Association of Sri Lanka. Headquartered in Singapore, PropertyGuru Group is Asia’s foremost online property company. Voted by consumers in 2016 as ‘Asia’s Most Influential Brand for Online Property Search,’ PropertyGuru helps over 16 million people find their dream home every month. A one-of-its-kind development in South Asia in terms of architectural design, structural engineering, and living experience, Altair has completed its structural construction and is already 70 per cent sold. The building comprises of two tower blocks, a 63-storey sloping tower which leans in to a taller, 68-storey vertical tower. Acknowledged as a new paradigm in contemporary living in Sri Lanka, the Altair building has already brought a new dimension in aesthetics to Colombo’s skyline and offers its 400 apartments spectacular views of the Beira Lake, the Indian Ocean and the city of Colombo. The development’s 1.5 million square feet of high-end eco-friendly living space is supported by 40,000 square feet of up-market retail space. The building was designed by the globally renowned celebrity architect Moshe Safdie.